Need a gourmet pick me-up? Our range of gourmet soup flavours make for a deliciously uplifting snack. 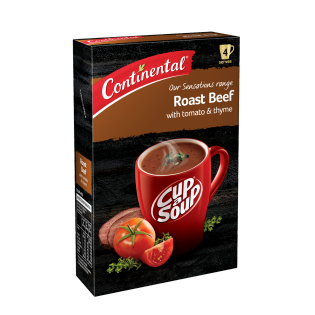 Try Continental Sensations Roast Beef with Tomato and Thyme! Potato starch, maltodextrin, thickener (1412) (contains wheat), vegetable powders [tomato^ (13%), onion], natural flavours (contain milk), sugar, mineral salt (potassium chloride), salt, yeast extract, beef (1.5%), herbs (parsley, thyme), burnt sugar, spices (celery seed, black pepper), garlic powder, food acid (lactic). ^ From responsibly grown tomatoes. Contains naturally occurring glutamates. Best beef cup o soup there is, I've also used it to add flavour to a weak gravy.